In 1977 how does an eight year old boy living on the New Jersey shore emotionally survive his father’s mental illness and the news that his paranoid schizophrenic father has been murdered? How does he survive the fact that his body has never been found and there never would be any closure for him? How does he survive the fact that the same genetic predisposition might be his? Music. Well, that little boy grew up to be the lead singer/ songwriter of one of the few multiplatinum, Billboard awarded and twice Grammy nominated rock bands of the 90’s to survive and thrive when most have gone into oblivion. No big PR firms, trashing of hotel rooms, or over-the-top pyrotechnic concerts; just plain great lyrics and music written and performed from his heart that have given him venues full of loyal fans for 20 years in both his solo and band’s career. That band is Tonic and the musician/composer is Emerson Hart. 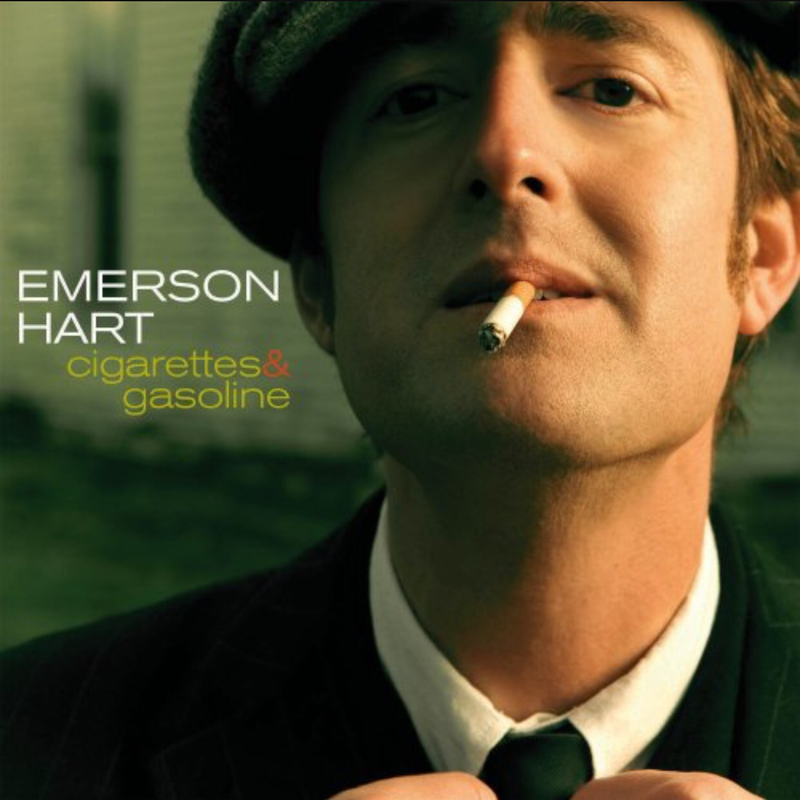 Everyone has known his songs, but until his solo career, in spite of his success and awards in singing and writing for Tonic, movies and television, who recognized the name ‘Emerson Hart’? Although Tonic was a force in the music arena, it was not until 2004 after the release of his first solo album “Cigarettes and Gasoline” and his ability to talk about his father through his music and interviews did he start getting recognized for his songs everyone had been singing for years. 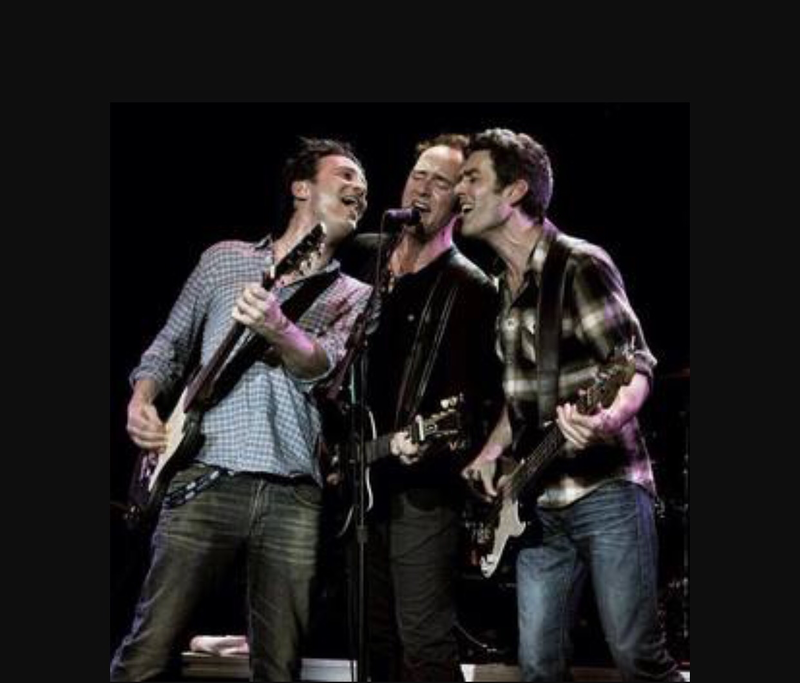 Along with Emerson’s songwriting success, his Tonic co-founder and lead guitarist, Jeff Russo, has scored several television shows, including the television show, Fargo. They are both musicians with something to say. As my son often reminds me, “It’s not always about fame”, but loving what you do and making great music. These musicians, both Emerson and Jeff, have relatable human interest back stories and I am not alone in thinking that in this digital age Fair Pay for Fair Play must be demanded by music fans to keep all music alive. It is a real issue concerning the plight of the 90’s rock bands who were surging on the cliff of the changing musical tastes of 2000 and now trying to survive through the streaming age. 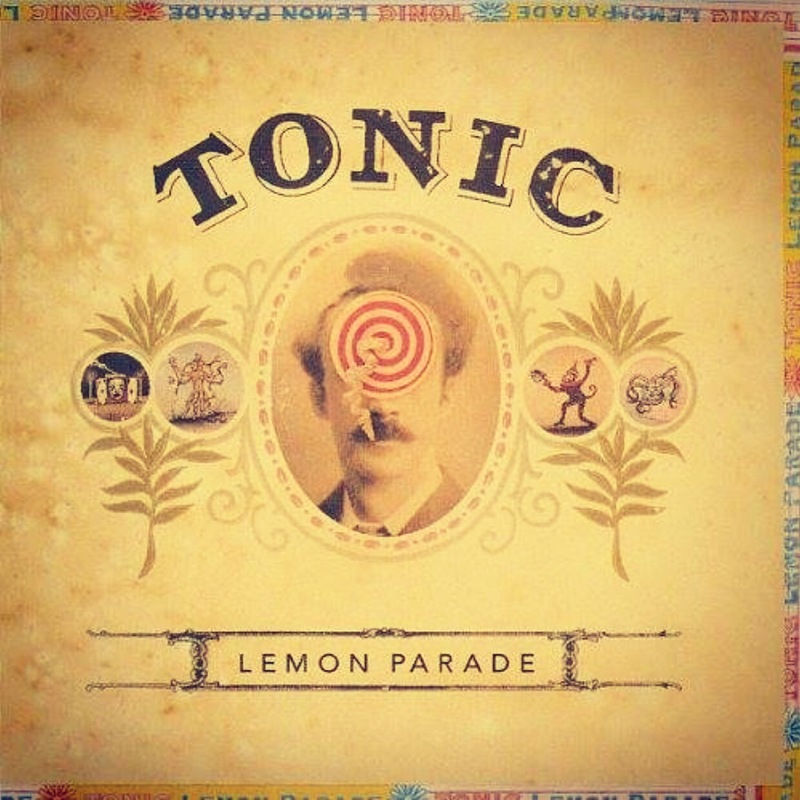 A Twenty Year Tour with new Tonic material and special re-release of 1997’s Lemon Parade with “If You Could Only See The Way She Loves Me” is planned for 2016. Still standing after all these years. If you are a fan of keeping great rock alive and want to celebrate this milestone year for Tonic, check out the links below. 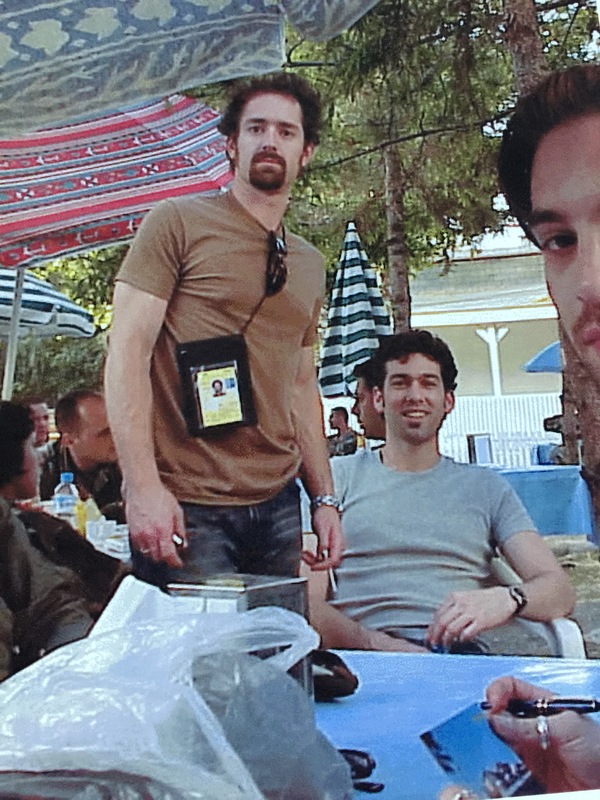 In June of 2000 my son, Emerson Hart, and his band Tonic traveled to Kosovo and Bosnia to entertain our American troops. It would be first of many more war zone tours the boys would do in the ensuing years, including going in to Iraq, where Emerson almost was blown away by a mortar that landed near Saddam Hussein’s palace where the band was staying. During the Kosovo tour our men and women soldiers there were tired, home sick, but always the best audience when any American came over to entertain and spend time with them. The boys always had such a warm greeting whenever they landed at the various camps along the way. Emerson, whose father served in the Army during the Korean War, has always felt it was a privilege to be able to give back to our troops protecting our freedom. So when I recently discovered a diary post from the Tonic website from June 2000 of the days they spent during that Bosnia tour I thought I would share it with my readers and you Tonic fans. The sad reality is that Fourteen years later the Middle East is still at unrest. 9 PM….Showtime! The show was great…. these men and women are the best audience ever considering the fact that they’re not allowed to leave the base unless on patrol…and it is a dry base-no alcohol at all. They really made us feel welcome. 11 PM….The deputy mayor of the base presented us with a certificate of appreciation. Then we met with a lot of the soldiers, signed autographs and took many pictures. 1 AM…… Sleep at last!!! 8 AM…… Why are we up so early? 11:30 AM…… Flight to Skopje, Macedonia. They have to reroute our flight around Serbia since they will not let us fly in their airspace. The flight takes us over Italy and the Adriatic Sea. A one hour flight now takes three hours….the sites were very beautiful. 2:30 PM…… Arrive Skopje, Macedonia… Wait on the French military installation after the Chanuck helicopter to pick us up to take us to Camp Bondsteel in Kosovo. 3:30 PM…… Helicopter arrives. We find out that the gear had been delayed coming over the border from Germany , so now our helicopter has to sling load the gear in a huge metal compartment. That compartment is then hanging from the bottom of the helicopter as we fly… 16,000 pounds!!!! 3:35 PM…… Flight briefing and Flak jacket and helmet fitting. 3:45 PM….Departure for Bondsteel. As we crossed the border between Macedonia and Kosovo, the escorts put on their Kevlar vests and lock and load their M-50 machine guns. Emerson gets to ride shotgun next to the pilot and the flight engineer. Jeff rides next to the star board gunner. Dan rides next to the floor opening where there’s a soldier lying down keeping an eye on the cargo below us. Remy looks like he’s going to fall asleep. 4:30 PM….Arrive at camp Bondsteel. 5 PM…… Showers? I don’t think so..Dinner… Again… the food is really good. 6:30 PM…… Major Dillon presents us with coins from the base on behalf of the Brigadier General Sanchez. They even made a concrete star for us and they had us sign! 9 PM… Showtime once again!!!! 11 PM…… After the show we met more soldiers and signed a bunch of autographs. We had to be done by 11:20 so we could get on the chopper back to Skopje, Macedonia. 1120….Board the chopper… Jeff sits shotgun in the cockpit wearing night vision goggles. Emerson sits next to the gunner on the port side of the chopper and Dan sits next to the gunner on the starboard side. Remi has night vision goggles also, sitting in the rear of the chopper next to the open bay door. In flight we saw a house burning with all of the people standing outside watching it burn. Hard to watch. 12:30 AM….dinner at the Army base. 1:30 AM….Arrive hotel in downtown Skopje … SLEEP!!!! 3:00 AM… Emerson gets awoken by gunfire outside of the hotel. Needless to say, that was frightening! DAY OFF….Dan and some of the crew go into town to see the sights – – – Emerson, Jeff and Remi sleep most of the day – – that night we all go to town for a dinner that was great. The whole place is amazing… It’s weird to think that it was a communist country only nine years ago. 11:30 AM…… On the chopper to camp to Montieth. 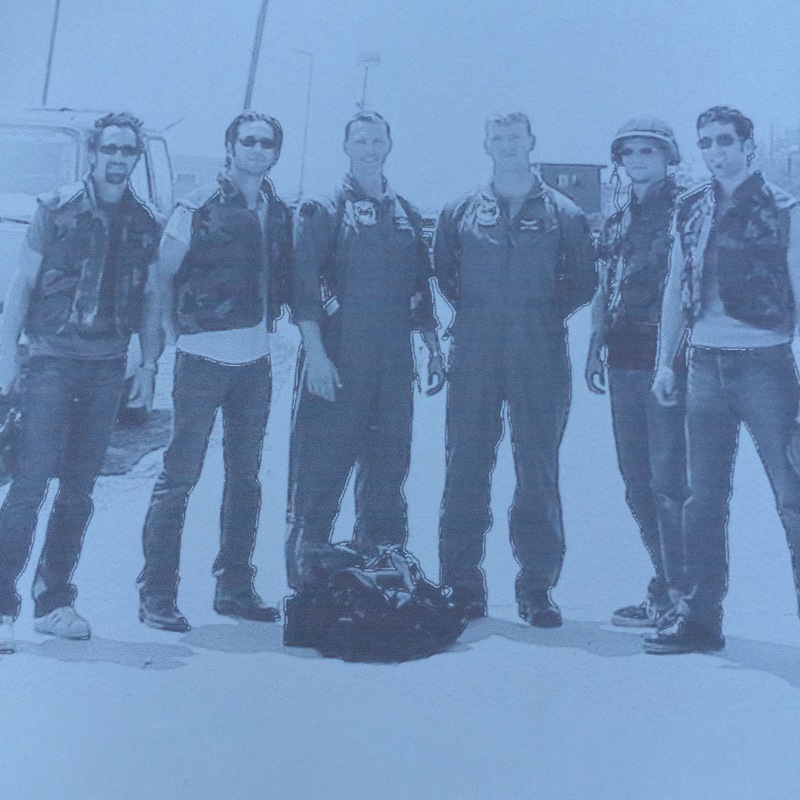 On the flight we saw more destruction and empty houses than on the other flights… It was pretty surreal… Dan sat shotgun, Emerson rides with the gunner again, Remi hides in the middle and Jeff is in the back by the open bay door. 12:15 PM….arrive at camp Monteith. This camp has many more trees and we see locals working on the base, but it is much smaller than the other three camps we visited. 1 PM…… Lunch… Outdoor barbecue… Wow!!! 5 PM…… Resorting to sitting on the camp bus so we can be in air-conditioning… It’s 105°!!!! 6:30 PM…… Dinner with the crew in the commander of “Big Windy”, the flight crew that is been flying us all over Kosovo in the helicopters. Definitely some of the nicest people we’ve met!!! 8 PM…… Showtime… A lot of the soldiers that were at this particular show where about to leave for home the next day. They had been there for seven months. They were really rowdy and into the show. They were also REALLY ready to go home!!!! 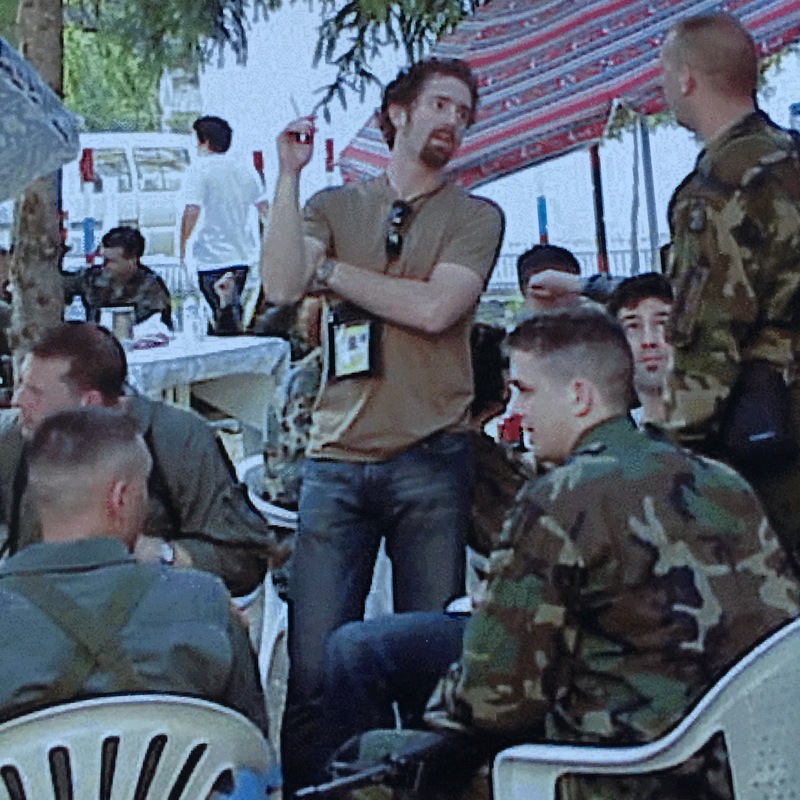 11 PM…..Signing autographs and taking pictures with the soldiers….Are all such great men and women. 12:15 PM….Chopper back to Camp Able Sentry and Macedonia. Jeff gets to sit on the way back of the helicopter dangling his feet off the back. Emerson’s next to the Gunter again, Dan is in the middle and Remi is in the rear. This was the best flight. The pilot really pushed the helicopter to the max… Flew about 35 feet off the tree line. Like a roller coaster ride. Pretty unbelievable. 1:30 AM snack time at the mess hall at Camp Able Sentry. 3 AM….Hotel… Lights out… Sleep!!! Fly to Amsterdam and begin the rest of the European leg of the tour. This whole trip was such an amazing experience for us. Everyone was so gracious and kind. Playing for the troops was truly amazing and fulfilling. Besides, when do you ever fly in a chopper into a war zone!!! !